American Ryan Lochte produced one of the most inspired day's swimming in world championship history to claim his second and third golds of the week and set a personal best in qualifying for the 100 butterfly on Friday. He has played second fiddle to compatriot Michael Phelps for the majority of his career but with the most decorated swimmer in history now in retirement, Lochte seized his moment to help make it another glittering day for the United States at the Palau Sant Jordi in Barcelona. Digging deep into his energy reserves and ignoring the pain on the day before his 29th birthday, he cruised to victory in the 200 metres backstroke, adding to Thursday's gold in the 200 individual medley. An hour later he was back in the pool qualifying for Saturday's 100 butterfly final with the fastest time of his career and just over half an hour later he crowned a stunning day's work with a key contribution to the US victory in the 4x200 metres freestyle relay. Lochte is the first swimmer to win two world championship golds in one day on three separate occasions, taking his tally of world titles to 15 compared with 26 for Phelps. His triumph in the 200 backstroke was his third in a row and he is only the second man to win three straight titles in the event after compatriot and world record holder Aaron Peirsol. 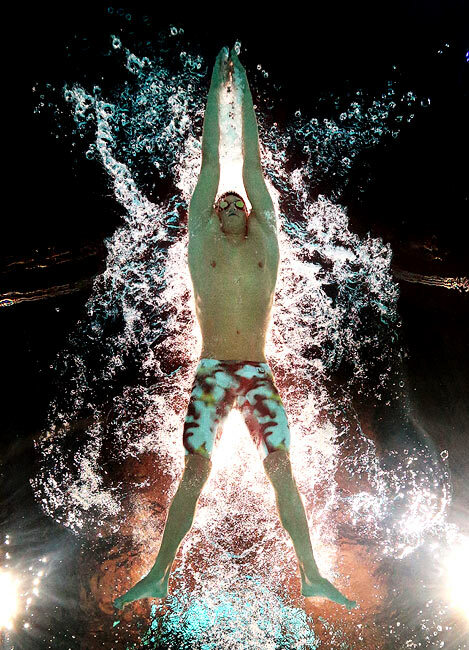 Lochte is also the first swimmer to win five world championship golds in one relay. Friday's victory was the fifth in succession for the US in the 4x200 freestyle since 2005 and their eighth in 15 championships since the inaugural edition in Belgrade in 1973. Lochte swam a blistering second leg to overhaul early leaders Russia, giving his team a healthy lead they comfortably held. 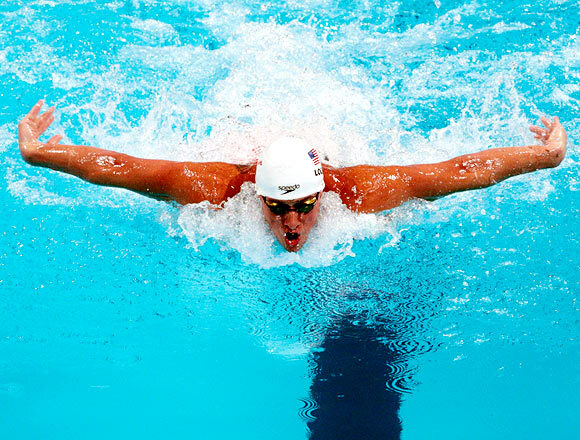 Phelps is the only other swimmer with five golds in one world championship event, the 200 butterfly. "It was so painful, I don't want to do that again," Lochte, one of the most popular athletes with the 9,000-strong crowd, told reporters. "But no matter the outcome in the first and second races I had to pull it together for Team USA," he added. "When you get together for a relay you don't care about the pain, you don't care about anything like that. "You just get up there and put together a good race for the other guys." Lochte's exploits outshone a fine performance and an act of redemption for Cate Campbell of Australia. The 21-year-old was forced to miss the 100 metres freestyle at the London Olympics last year because of illness but she scorched to victory on Friday ahead of Sweden's Sarah Sjostrom and Olympic champion Ranomi Kromowidjojo of the Netherlands. Campbell's gold matched the one claimed by her compatriot James Magnussen in the men's version on Thursday. "Oh gosh, did that just happen? I can't believe it," she told reporters. "I am beyond words. This never happens to me, I always have words. I'm just so, so relieved. "I knew I could put together a good race but having a good race under pressure is a lot harder. "Australians are back top of the world when it comes to sprint freestyle." In Friday's other two finals, Daniel Gyurta of Hungary became the first man to win a treble of 200 breaststroke world titles when he claimed a third consecutive gold with a championship record. Gyurta, 24 and the Olympic champion in London last year, clocked two minutes 07.23 seconds, beating the previous record of 2:07.31 set by Australian Christian Sprenger in 2009. Russia's Yuliya Efimova overhauled favourite and world record holder Rikke Pedersen of Denmark to win gold in the women's 200 breaststroke. Silver medallist at the last world championships in Shanghai two years ago, Efimova touched in a time of two minutes 19.41 seconds, with Pedersen, who set a world best of 2:19.11 in her semi-final on Thursday, taking silver in 2:20.08. 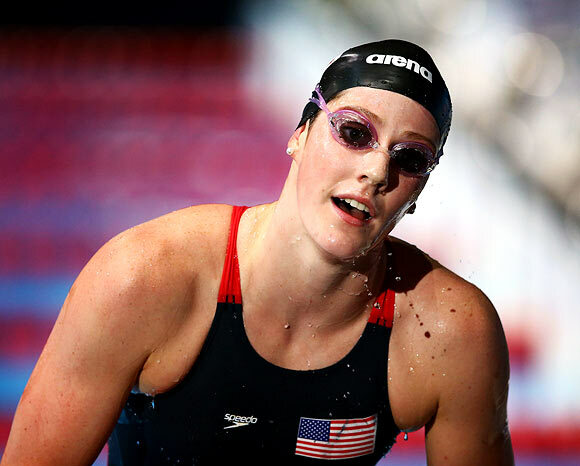 While Lochte shone, his teenage compatriot Missy Franklin suffered her first setback of the week when she could only manage fourth in the 100 freestyle having won all four of her finals before Friday. The 18-year-old has claimed two relay titles and golds in 200 freestyle and 100 backstroke and if she manages a fifth triumph in her remaining two events she would match a feat achieved only by American Tracy Caulkins in 1978 and Australian Libby Trickett in 2007. No woman has won more than five golds at a world championships - East German Kristin Otto won six at the 1988 Seoul Olympics. Franklin goes in the 200 backstroke final, one of her favourite events, on Saturday and is due to swim for the United States in Sunday's 4x100 medley relay.